Looking to have a new Bathroom installed? Clifton's are the regions expert installers. We want you to enjoy the experience of creating a new paradise for you to relax in. We have a proud reputation for high quality and reliability. Using this approach we can make your dream a reality. 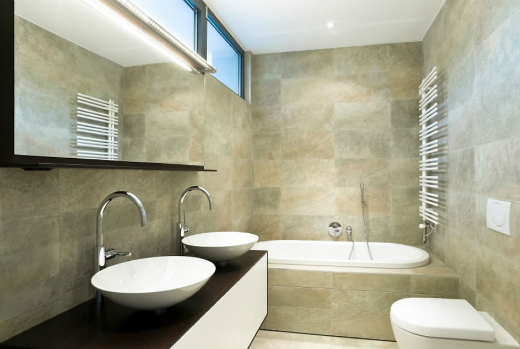 We are trained to advise you on the best bathroom suitable to come within your budget. We are proud to be the regions installer to B&Q. Quotation - We will provide a free no obligation consultation and quotation. We will happily invite you to come in, sit down with us and discuss your requirements. Design - We know it's important to get the design exactly right. We want to ensure that your new Bathroom meets yours and our own high standards, as we do not settle for anything less. Unlike most companies we can provide you with a service were we sit down with you and discuss your specifications and provide industry expert opinions on layout and the general design of your domestic project. Planning - We know you don't want your spare time taken up by planning your new Bathroom. That's why we can do it for you. We will take the hassle of planning an installation away from you, with expert analysis and opinions on how to maximise your bathroom space. Rip Out - After the design and planning of your new Bathroom has been finalised we will begin the removal of your old Bathroom ready for your lovely new one to be fitted by Clifton's. Installation - Once the removal of the old Bathroom has been completed we will begin the installation. Ensuring that all the Pipework and Units are installed correctly and finished to a high standard. We will also cover other areas of the installation such as the Tiling, Plastering, Carpentry, Electrics. Waste Management - You don't need to worry about cleaning up after us. We will mange the complete removal of waste and excess materials during and after the installation. Ensuring that you new Bathroom is safe for use. Completion - You now have a lovely new suite installed by Clifton's. We encourage our customers to check over the work we have completed to ensure that is at the standard they expect, making any alterations where necessary. If you are interested in having a new Bathroom installed, feel free to Contact Us for more information.